Private music lessons are available for students of all ages and abilities across the Greater Montreal area and surroundings. Our teachers are highly qualified and specialized in Classical, Jazz, Popular and World traditions for all instruments and voice. 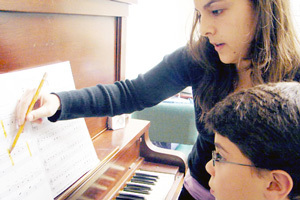 Music lessons are available at our school and in our studios across Montreal and suburbs. Music lessons are also available at your home. Private instruction is personalized to suit the level and interests of each student, ranging from the young beginner to advanced artist development.